Are animals allowed in the dining room or on porches or patios? We love pets as much as we love pizza, but unfortunately no, animals are not allowed on the premises per DHEC regulations that require certain additional sanitation station modifications to each pet friendly area. However, service animals are permitted. Though we do not offer a certified gluten free kitchen environment for those with medical restrictions, we do offer several options for those following a gluten free lifestyle. Any of our specialty pizzas can be made on gluten sensitive crust. Please speak to your waitress or give us a call to see what their current gluten free offerings are. What allergies do you accommodate? At this time Ultimate California Pizza utilizes ingredients that contain milk, eggs, soy, wheat and flour, and peanuts. UCP also utilizes vegetable oil in our fryers. Please call us if you plan on visiting for more detail if you have concerns and we will try our best to accommodate your needs. We want you to be able to enjoy our handcrafted pizza as much as we do! Do you offer vegetarian and vegan options? Of course! We offer endless pizza creations that can be vegetarian and even offer a vegan cheese! Our menu also offers delicious salads and several appetizers that are vegetarian. Do your locations have alcohol or a bar? Whether it’s a long day at work or just celebrating being on vacation, sometimes you’re craving something a little stronger. All of our locations do serve bottled beer, liquor, and wine and offer various amounts of bar seating. What sort of dining areas do you provide? We are a comfy, family friendly place and offer both booths and tables, as well as some outdoor patio dining. Plus all six of our locations are in close proximity to exciting attractions and local hot spots around Myrtle Beach. Do you have private dining areas? We do offer a private dining room that is available to reserve for parties and events at our Ultimate California Pizza Game Zone location. This location offers party packages and event packages, including pizza buffets. Give them a call for current availability and party package offerings. We do not take reservations at this time, but if you are with a large party or planning to bring a large party, just give us a call ahead and we will try to accommodate you as best we can or advise you when is best to come in. Please remember that seating is a first come first, serve basis so calling ahead does not guarantee seating when your party arrives. Does our kitchen staff singing count? But unfortunately, the answer is no. Do you offer carry out or delivery? Yes! We offer both carry out and delivery so getting a hot, made from scratch pizza is easy! Do you offer any specials or happy hour? For those looking for a delicious deal for lunch, we do offer a Lunch Special featuring a personal 1 topping pizza and fresh side salad. Of course! We have fun and informative Facebook and Instagram accounts where you can find updates, useful info, and specials. You can follow us on Facebook at Facebook.com/UltimateCaliforniaPizza and on Instagram at UltimateCaliforniaPizza. Do you offer a kid’s menu? Yes, we offer various fun-sized entrees for kids. There’s even a PB&J pizza on there! What type of dining experience can I expect? 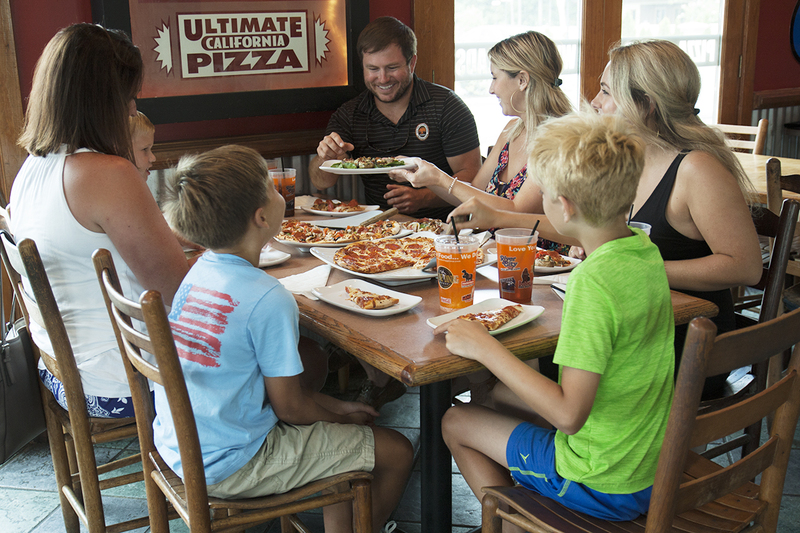 You can expect a fast, but casual experience at UCP that is perfectly suited for the whole family and centered around a family favorite – pizza! What type of food does your menu offer? Our menu boasts specialty handcrafted pizzas featuring over 70 of the freshest toppings. Our flagship pie is the Big Kahuna with 14 toppings and we offer plenty of shareable appetizers, freshly toasted subs, and crisp green salads as well. 11am til… varies depending on season. Yes! We have plenty of gear for sale. Just see our various locations for our current styles and size availability. We hope this helped answer some of your questions. And if you didn’t see yours on here – don’t worry – no question is too cheesy? Feel free to give us a call at any of our six locations. We can’t wait to see you soon!